My daughter and I were able to try out the Farfaria reading app for children and I want to share what it’s about and how it works. Farfaria is a app you can download on iTunes and then for a 3.99 monthly fee your child can read over 700 books and 5 new books are added each week. It’s a perfect bedtime reading app. I feel reading apps are great for the reluctant reader and also to develop the love for reading. A child who doesn’t like to read is more willing to read a book off a iPad or something similar than an actual book because it catches and keeps their attention. They will love to find a new book to read. The illustrations are high quality and colorful. This app is ideal for summer reading. My daughter love the app and found a lot of books to read. She loved the illustrations too. IF you are looking for a good reading app that is inexpensive Farfaria is perfect. At $3.99 with so many titles to choose from you can’t beat it. Unlimited reading from our library of more than 600 stories. Every story can be read aloud with a Read-to-Me feature. No advertising. No hidden fees. 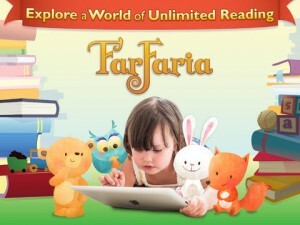 Why do kids read five times more with FarFaria? Over 700 fun and educational books to choose from. Reading levels help build confidence in reading and comprehension. Child-friendly navigation that is fun and easy to use. Educational math and science stories that stimulate young minds.